We all know Breakfast is a meal not to be missed, but come on guys! I cannot get excited about eating a bowl of cold cereal from a box for breakfast... now at snack time some cereal is my go-to, but for breakfast? Give me something healthy, delicious and it has to have some visual appeal too! 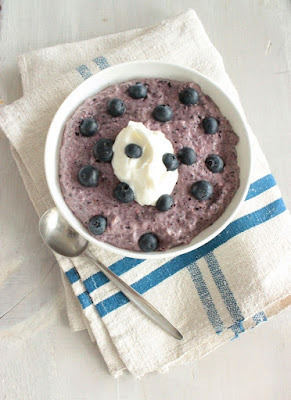 This Blueberry Chia Breakfast Bowl is the way to go for a start to your day that is almost too pretty to eat and that is so delicious you just might hop out of bed at the thought of it! In a blender or food processor combine blueberries, milk, maple syrup and banana; blend until smooth. Divide mixture among two serving bowls. Stir in oatmeal and chia seeds. Have you ever had a breakfast bowl like this Blueberry Chia Breakfast Bowl? This one is nothing short of incredible. I love that it is packed full of fruit and oats and that it can even be made the night before for a super easy start to the day! Thanks to my friends over at the Blueberry Council for inspiring this post!